Potential clients and customers see your storefront or building facade. As you know, a customer’s or client’s first impression can make or break a deal. Carolina Custom Signs & Graphics works with you to ensure your customer’s can client’s first impression is a great one. When your business boasts high-quality building signs, it sets your company apart from other businesses in the area. Building signs capture the attention of people passing by your business. This interest equates to increased profits. Whether you are looking for a promotional building sign or a building sign with your logo, we will design, manufacture and install the optimal building sign for your building’s facade and your budget. Call Carolina Custom Signs & Graphics at (336) 252-2032 for your Free Consultation with a Building Signs Expert! Your requirements for your building sign will be different than other businesses. 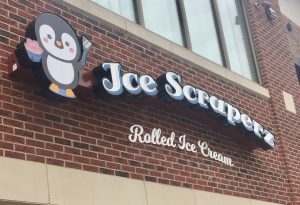 Your location, target audience, location, competition, brand personality and budget will all determine the choices that you make regarding your sign. Our building sign specialists will visit your site and complete an onsite assessment of your building, including measuring your space. After the evaluation, the specialist will recommend the best processes, products and elements for your building sign. Once you agree on the sign, we will get to work on the manufacturing and installation of your new building sign. But, the service doesn’t stop there, we also handle any maintenance or repairs, and will even help you with getting the necessary permits for your new sign, if needed. There are several different types of building signs that you can choose from. The one our specialist will recommend the sign based on your business type and your location. The perfect sign can either complement the other signs in the area or contrast against them to help you stand out. Either way, we will work to determine the best sign for your location, your budget and your business. Each of our signs is custom made, which means that your sign will stand out even if you use the same type of sign for your business. 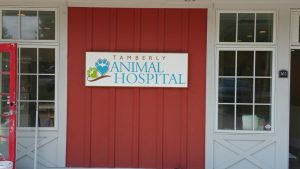 We will work with your to determine a sign that is unique while creating a cohesive look with the other signs in your area. One of the most popular types of signs is channel letter and dimensional letter signs. These signs are versatile and offer you a number of style, color and font options. Dimensional letters and channel letters allow you to use individual numbers and letters along with logos and shapes. Retail stores, manufacturing facilities and other types of businesses often choose these types of signs because they can easily be customized and offer outstanding durability. Channel letter signs can contain a light to illuminate the lettering to help attract attention. The sign will have a transparent face and the dimensional letters with either be cut from acrylic or metal. Another option is lighted building signs. These signs are designed to capture visitors’ attention during the day and during the night. There are several different types of signs that can be lit or backlit. Channel letter signs and cabinet signs typically contain an internal lighting element. These type of signs are perfect for businesses that are open late like gas stations, retail stores, bars, theaters and convenience stores. 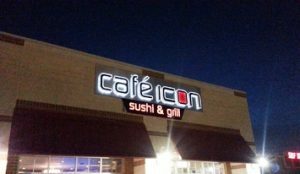 Lighted signs are a great way to increase your business’s visibility after dark. 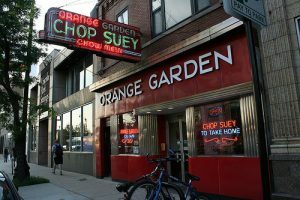 A blade sign, also known as a hanging sign or a projecting sign is one that is placed perpendicular to your building rather than attaching against your building’s facade. These sings can be made of high density urethane foam, metal or wood. They are a great choice for getting foot traffic attention and are often used with other types of signs. A blade sign can also be used as a directional sign for a business is located inside a building that does not have a storefront like a private investigators office or other small business located above a bookstore, a bank or other larger business. Awning signs not only advertise your business but also helps to protect your storefront. 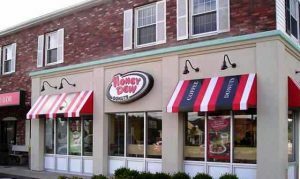 Awning signs are commonly constructed using stretched canvas; however, they can also be made using a variety of fabrics, or even metal, depending on your specifications and desires. Typically, we recommend products that resist weathering, which increases the lifespan of your building sign. 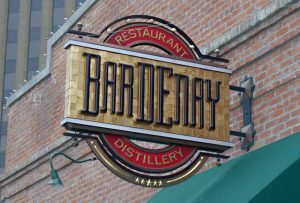 Awning signs help to create a boutique fell or to offer a canopy area for an open air restaurant or hotel. We at Carolina Custom Signs & Graphics are ready to work with you to design and create the perfect sign for your business. We understand how choosing the right building sign can increase your profits by increasing customer attention. Let us start designing, manufacturing and installing the perfect sign for your business today.